This year during Pride Month take some time to support the work of talented queer authors. As time goes on, more and more queer authors are getting published in both fiction and non-fiction. What is so amazing about this is that queer voices are being heard more often across the media, which means queerness in culture is getting more normalized as time goes on. I’ve been out and proud since college -- though I am embarrassed now that it took so long for me to figure it out. I grew up around LGBT individuals and couples and I cultivated my love of writing because of male/male fanfiction. Once I finally understood that I was bisexual, I was obsessed with finding books about queer characters, and it was a challenge. There are some amazing resources out there to help you find fantastic novels featuring queer characters, but I wanted to find queer authors who are writing about queer characters. These are some of the amazing queer authors that I’ve found. 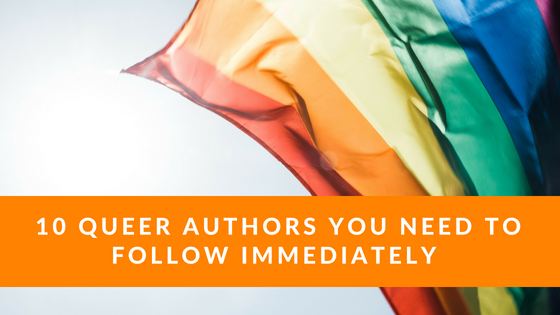 I tried to focus on finding modern LGBTQ authors who are still regularly producing content so you can support their work as they write more amazing books. If you’re like me, you probably heard of Malinda Lo because of her lesbian re-telling of Cinderella. Taking a problematic tale and flipping it to make it not only a story of a female hero, but a queer hero, is enough to snag anyone’s attention. Malinda Lo has several other YA fantasy novels, including one that was published just a few months ago. Malinda Lo also researches diversity in YA. She’s a proud Asian author who posts regular social commentary on topics revolving around diversity. This author writes about events set during Victorian times with lesbian themes. That’s something you simply don’t see very often. She spends a lot of time doing research for her work, creating a vivid setting that feels completely realistic. I may be a bit biased because I love the Victorian period, but she’s written about other time periods as well. She’s not published anything new in the past couple of years, but you should definitely check out her old work and keep your eyes peeled for new releases. If you are looking for diversity in the books you read, this is a queer author you need to check out. Her work features characters who are: bisexual, transgender, Hispanic, Chinese -- and that’s just the start! But her most popular work doesn’t focus on this diversity specifically, because the characters are too busy having superpowers. Her books are the kind of stories I was looking for when I was a teenager. Keep an eye on her work; she’s not going away anytime soon. I’ve not read this author yet, but I am so excited to. He plays with the role shame has in the life of a gay Arab man in his debut novel, which takes place in an unspecified Arab country after a failed political uprising. This is a unique perspective when it comes to queer stories and I’m really eager to see what this author has to say. This is his first novel and he doesn’t come from a writing background, so I’m not sure if he plans to keep writing. Either way, his voice is one to listen to! David Levithan is pretty well known in the LGBTQ fiction scene, and for good reason; he’s been publishing books featuring strong, gay characters for over a decade. As a teenager he was one of the only authors I could reliably find publishing YA with queer characters in my local library. He’s still writing so keep an eye out for his work. He also has done collaborations which are worth checking out as well. Support A queer author with a cup of coffee! I cannot talk enough about this author. If You Could Be Mine isn’t just a story about two women falling in love, it’s a story about two women falling for each other in Iran. I was so excited to discover a novel that focuses on a part of the world we rarely get to see in Western media. The cover art for her new book was just announced, which focuses on the topic of race in high school. She also has a second novel, Tell Me Again How a Crush Should Feel already published. If you like diversity and YA fiction I highly recommend you look into her work. Immediately. This author and advocate wrote the award-winning speculative fiction novel All the Birds in the Sky. This is a story that combines magic, technology, and the apocalypse all into one book. She’s also organized a lot of events that are aimed at the queer community. She’s still writing and her newest work should be coming out next year. I feel as though trans individuals are highly underrepresented, so I’m excited that someone so proud and vocal is getting published. This man has written across a huge range of genres, so you’ll probably find something you like by him. I’m not kidding. He’s written YA, middle grade lit, picture books, and adult books. He’s a gay man writing gay characters into stories that didn’t used to have gay characters. You can read this author’s work yourself, but also share his picture books with children. Like I said, he’s written something for everyone. This Nigerian-American author made a huge splash in the literary world and is proof that those who work in education can also publish amazing novels. I could list all the awards she’s been nominated for with her debut novel, but that would simply take up too much space. She’s also published a lot of short stories and essays, which are worth checking out if you can find them. C.A. Higgins is a relatively new author, which means she’s got many years ahead of her to keep publishing books. Her work is firmly written for sci-fi fans, dealing with both classic topics (space) and newer topics that have been gaining traction in fiction in recent years (AI). Also, she has a degree in physics, which gives her an edge over other science fiction authors. To be fair, I’ve only seen her mention girl crushes in several interviews, so I’m not exactly sure where she fits under the queer umbrella, but she’s an author to watch! Ok, so I’m not published yet and I don’t have any books out that you can read, but I’m getting close to finishing the first draft of FanFact, a story about a fangirl who finds herself in the “fictional” world of her favorite book series. She runs into Blane and Liam, the two boys she ships in the series, and gets tangled up in the plot of the third, not yet released book in the trilogy. Every project I work on features queer characters, so stick around if you’re interested! I blog here weekly and send out the occasional email to email subscribers with exclusive content. Who is your favorite queer author? Let me know in the comments!